With the 2nd edition of Blood & Treasure essentially done (well, almost done), I can get back on track with these Dragon reviews. 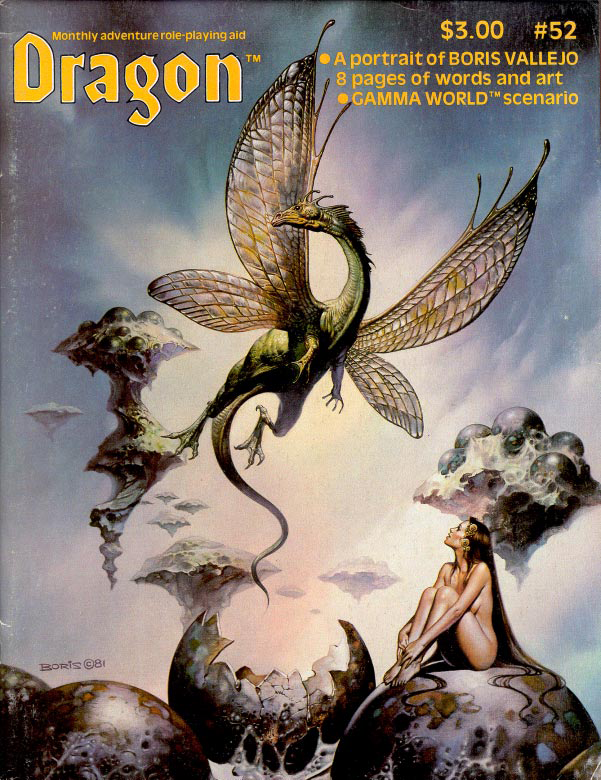 Number 52 is from August of 1981, and features a Boris Vallejo cover of a butterfly-winged dragon and beautiful naked woman … which of course is a rarity for a Boris painting. Boris gets a little full article inside the magazine as well. First and foremost, a nice piece of comic/advertising work by Bill Willingham, one of my favorites from the olden days. This involves the adventurers Auric, Tirra and the wizard Khellek (who does not appear to be this guy – scroll down a bit). Auric is an ill-armored fighter, Tirra could be a thief or fighter and Khellek is a wizard. They tangle briefly with a jackalwere and then … to be continued. 3. Attending rites or church services. 4. Feasts, festivals, fasts, self-punishment, vigils- as part of religious rites. 6. Dying in a holy conflict. 7. Killing an enemy in a holy conflict. 8. Sacrifice of an unbeliever. 9. Sacrifice of an unwilling believer. 10. Sacrifice of a willing believer. #10 seems like a dicey prospect for Lawful clerics. Quickly leaps up, brave lord, and stands erect. Only one word: “I am not beaten yet! A thousand strokes he strikes into the press. And some of them made shorter by a head. So Turpin got to swing a sword, why doesn’t your cleric? Well, to start off with, Turpin also doesn’t get to cast spells or turn undead. Douglas thinks the rule should be thrown out, because its not “realistic” and because in AD&D the mace is as good as sword. 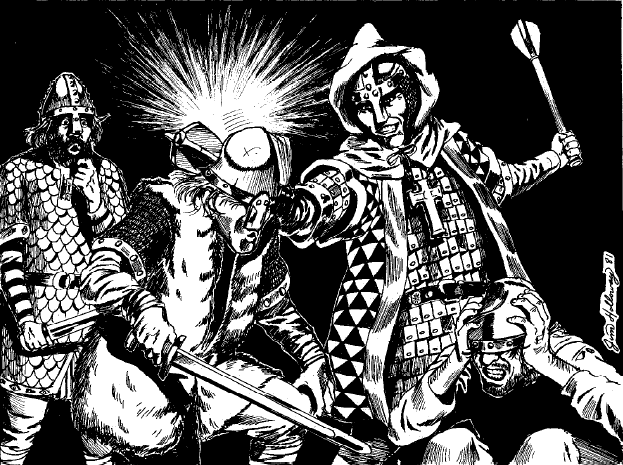 I disagree – swords are more than just a damage range, but the “no sharp weapons” rule also takes many magic weapons out of a cleric’s hands, thus helping the old fighter stay relevant. Douglas Loss is back with “The Sense of Sacrifices”, and this is a neat one about the chances of deities granting clerics spells they aren’t high enough in level to cast. It all hinges on sacrifices of inanimate objects (valuable or symbolic, of course), animals and sentient creatures of a wildly different alignment than the cleric. To boil it down – 2% per 100 gp value of inanimate objects, symbol items 5%, animals 2% (or 3% if it is favored by the deity) and 5% for sentient beings. The chance shouldn’t be higher than 50%, and each subsequent miracle should have a 5% penalty applied if the cleric tries this too often. Q: What happens when a Resurrection or a Raise Dead is cast on an undead? In other words – crap, we hadn’t thought of that. For lovers of the old school, the cleric stuff is followed by two articles concerning the new Basic D&D set. The first is written by J. Eric Holmes, author of the first edition, and the second by Tom Moldvay himself. Holmes has the longer article, and it explains the hows and whys of Basic D&D. Holmes fans have probably already read it, but if they haven’t, I would highly suggest it. Home Economics: travel potential moderate to high; starting salary $20,000/year (variable); almost no connection with what the field is normally thought of to include: agents in this field will very likely be chefs, or connected with the creation of fashion or decoration: female agents have a good chance of being models (salary quite variable). Physical Education: travel potential high; starting salary quite variable; almost certainly an agent will be an athlete in this AOK: by preference, one in a sport played throughout much of the world. Tennis is an excellent choice; golf, soccer and track & field are also good. Yeah, a pair of spies who work in a high school would be pretty fun. The best way to get the upper hand over Circe is to possess the strange herb known as moly. The god Hermes gave Ulysses some of this herb, said to grow only in Olympus. With it, Ulysses mastered Circe’s magic and made her turn his crew back into men from swine. If the DM wants moly available in the campaign, it should either be fantastically expensive or else a gift to a cleric from his or her god. If a character wears moly, all of Circe’s polymorph spells will fail against that character, and the power of her other spells against that character will be weakened considerably; the character should get a +2 on all saving throws against her magic. Circe cannot touch this herb to steal it away, nor can her maidservants. For more information on moly, click HERE. We also learn Circe’s spell list: 1st-charm person, comprehend languages, friends, read magic, sleep; 2nd-detect invisibility, ESP, forget, ray of enfeeblement, web; 3rd-fly, hold person, dispel magic, slow, suggestion; 4th-charm monster, confusion, fear, polymorph other, massmorph; 5th-animal growth, feeblemind, hold monster, passwall, transmute rock to mud; 6th-control weather, enchant an item, legend lore; 7th-charm plants, mass invisibility, vanish; 8th-mass charm, polymorph any object; 9th-imprisonment. 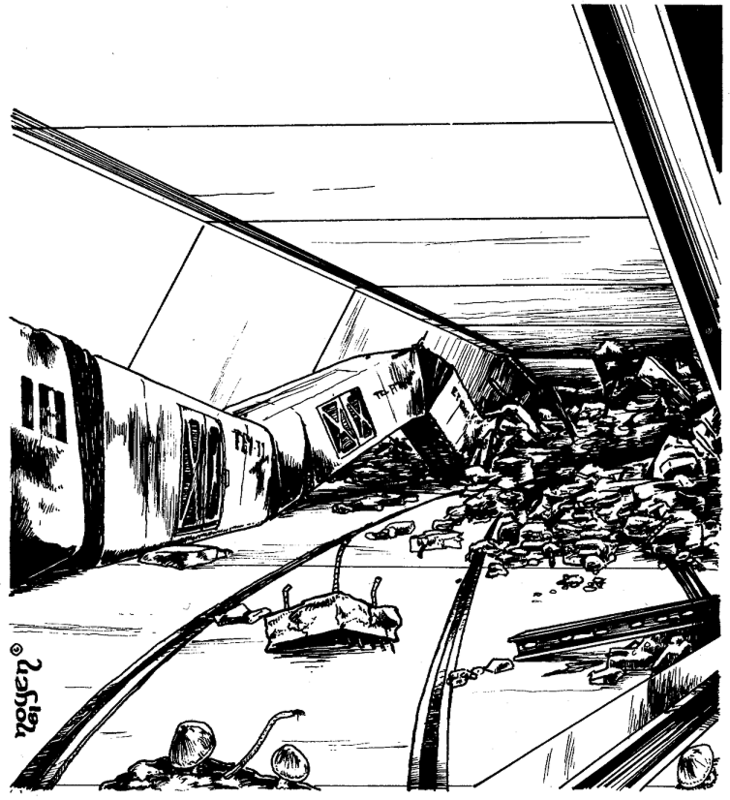 Dragon #52 also has a groovy little Gamma World adventure by Gary Jaquet called “Cavern of the Sub-Train”. This might sound like a subway romp in the ruins of New York, but it’s actually a romp through something more like Elon Musk’s hyperloop. This network spanned the entire North American continent. The adventure is left open-ended, so should come in handy to folks playing post-apoc games. Lewis Pulsipher has some interesting, peaceful gas-filled beasts called pelins. Not much for a fight, but they’re semi-intelligent, so maybe they could be helpful in completing a quest if the players are smart enough to be nice to them and attempt communication. Michael Kluever gives a nice history of siege warfare in “Knock, Knock!”. Worth a read for people new to the subject. Up next are three – count ’em three – takes on the bounty hunter class by Scott Bennie, Tom Armstrong, and Robert L Tussey and Kenneth Strunk. Lets judge them by the most relevant part of the class – the class titles! 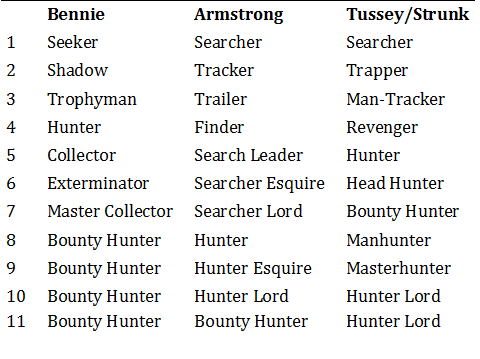 The use of revenger, head hunter and manhunter are nice, but the inclusion of esquire by Armstrong wins the competition. Anything that can bring Bill & Ted into the conversation can only be good for a D&D game. Hey – what the heck is this? 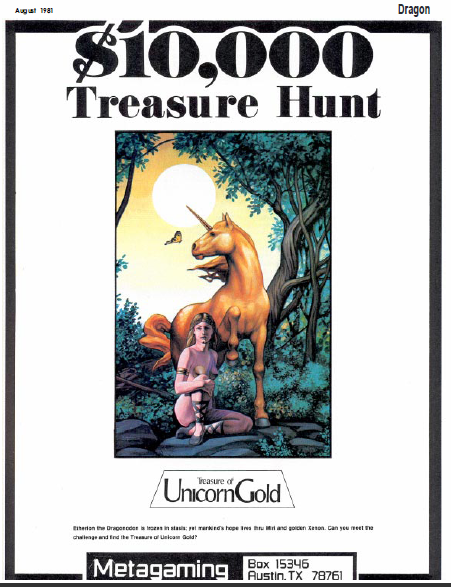 A Google search brings up a computer game designed for use with the Fantasy Trip. Pretty cool! There are reviews of some cool miniatures from Ral Partha (hill giant, storm giant, cold drake), Heritage USA (hill giant and beholder and superheroes and supervillains), Castle Creations (condor and skull splitter giant), Penn-Hurst/Greenfield (a plastic castle), Citadel (ogre, giant spider) and Grenadier (the dragon’s lair), as well as Basic Role-Playing, TIMELAG and Dungeon Tiles. Not a bad issue – more advice-centric than number-y, but you get bounty hunters and a paralyzing lizard, so what the hey! Remember – never trust gamers discovered in the wild!! !